Consider serving a preserved lemon and asparagus side. Or, try an almond cinnamon fava bean dish for a complementary nutty texture. - Season duck breasts with salt and pepper. Heat an oven-safe, non-stick skillet over high heat. Place duck breasts smooth side down in skillet; add pearl onions. Cook duck until browned (about 5 minutes). - Turn over breasts and add figs. Transfer pan to the oven and cook until done, approximately 5 or more minutes for medium rare. - Remove duck breasts from the pan and allow to rest for 3 to 5 minutes before serving. Return skillet to the burner over high heat. Add stock and reduce until thickened to coat the back of a spoon (about 4 minutes). - Add Grand Marnier and reduce back to thickened (about 2 minutes). Add more salt and pepper if needed. Remove from heat and stir in chives. 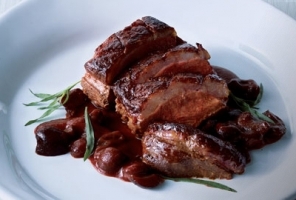 - Cut duck into thin slices width-wise or against the grain. Position the grain mix artistically in the center of the plate. Place figs at the top of the plate. Lay duck across the figs and the grain mix. Spoon sauce over the duck and figs. Serve immediately!